By default, Canva shows you only the basic features. Dig a bit deeper to find more advanced ones. Do you chomp at the bit to use design software? Unless design is your profession or hobby, our guess would be: not often. Those of us who aren't graphically inclined (example: Yaara) shrink from the complications of Photoshop, and even simpler programs take more effort than we're willing to expend. Those of us who design professionally (example: Erez) want powerful tools, but we're not sorry to take shortcuts if the results look right. If you need to make beautiful posters, invitations, cards, website graphics, or even multiple-page presentations, Canva is a design service you're going to want to use. Still in invitation-only beta, Canva is a design service that takes the friction out of designing. All you have to do is choose one of 11 available templates or start from a custom-sized blank canvas. You then use the Layouts and Background tabs to get a rough idea of what you want to design. These tabs are chock-full of options to choose from, whether you want a complete template or just a nice background to build on. Choose from the existing layouts, or design your own cavnas from scratch. Canva revolves entirely around intuitive controls such as drag-and-drop, so adding, removing, and editing elements on your canvas is almost a no-brainer. This also means that if you’re used to design software giving you a hand with page grids and object distribution features, you’re out of luck. Canva does show live orientation guides as you drag objects around, but they are not as sophisticated as those used by online typesetting services such as LucidPress. Canva's simple layout makes it easy to add and remove elements for the perfect design. Use the search function to browse an enormous repository of images, and the Text tab to add free text or stylized text with built-in backgrounds. While many Canva elements are completely free to use, most images you’ll see on search results are Premium, and will cost you $1 per image once you download your design. You can, however, easily upload you own photos or graphics, or use ones you have on Facebook, so while Canva's Premium options are certainly tempting, they're not a must. While working with premium images, Canva shows a pretty obtrusive watermark over photos. 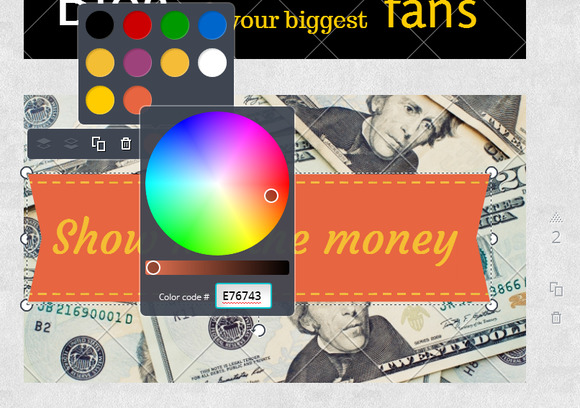 Rather than overwhelm with options, Canva gives you just a handful of picks. This is evident in the built-in color picker as well: You can change the color used for text and some of the built-in glyphs, but you’re first only presented with a limited palette of 5-8 colors that fit your general color scheme. If you know the specific hue you’re after, you can click through for a more standard color picker that also lets you feed in a hex color code. Canva is an amazing tool for the clueless, and can come in handy for professionals too. It makes designing uniformly easy for everyone, but it's by no means aimed only at amateurs. The simplicity and richness of the tools will get you coming back for more every day, and according to Canva's developers, the current features are only 1% of what they have in store for us. 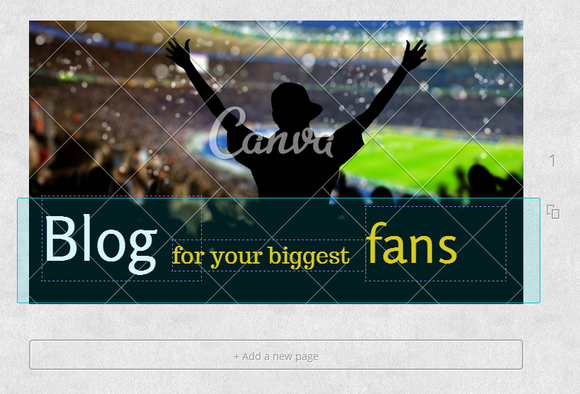 As it is now, Canva brings sophisticated design abilities to the masses. We can only hope future features don’t render the service complicated to use. Hurry up and request your beta invite, this is one service you won't want to miss. Canva makes design simple, easy, and fast.